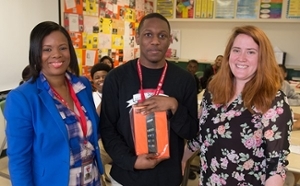 In a Black History writing contest designed to display ingenuity, aptitude and pride, three Southern Illinois University Edwardsville East St. Louis Center students won Amazon Kindle Fire tablets. The SIUE East St. Louis Learning Resource Center, located at the SIUE East St. Louis Center (ESLC), held a writing contest for local youth to celebrate its reopening and commemorate Black History Month. 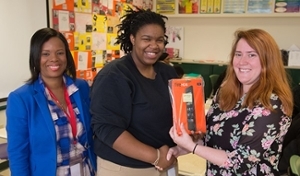 The Resource Center awarded a tablet to one student per grade from 9-12. All students who entered the contest were eligible to win the drawing. The winners were Dennis Dunblin, freshman at SIUE East St. Louis Charter High School (CHS); Kenyatta Gailes, sophomore at the ESLC Upward Bound Math and Science Program; Naomi Brewster, junior at CHS; and Aquaia Moore, senior at East St. Louis Senior High School. “We thought the tablets would be a good, technological way to assist students in their learning and to further encourage their STEM education,” said Lara Jennings, director of the Learning Resource Center. “The East St. Louis Learning Resource Center serves as a valuable resource to the students at CHS,” said Gina Jeffries, CHS director. “I am pleased to see opportunities such as this Black History writing contest to highlight some of the excellent works of our students. “I wanted to convey what really happened as part of our history,” said Dunblin, about his rap composition, Equal Freedom: Darker History. Brewster wrote the rap poem, Do Black Lives Matter? “... But if we really did matter, why try to send us away? Or try to kill us every day? It’s so depressing to say. Everybody’s looking for someone else to blame, yet we all playing the same crazy game. Winning first place in the Black History Month writing contest 9th grade category was SIUE East St. Louis Charter High School student Dennis Dunblin (center). On the left is CHS Director Gina Jeffries with East St. Louis Learning Resource Center Director Lara Jennings on the right. 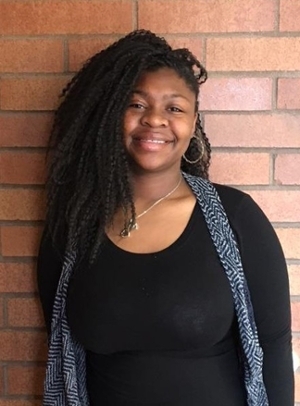 Winning first place in the Black History Month writing contest 10th grade category was Kenyatta Gailes, sophomore at the ESLC Upward Bound Math and Science Program. Winning first place in the Black History Month writing contest 11th grade category was CHS student Naomi Brewster (center). On the left is CHS Director Gina Jeffries, with East St. Louis Learning Resource Center Director Lara Jennings on the right.